When Globalrunners' many participants in Marcialonga this year went home to Sweden, I headed for Toblach to greet our next group of cross country skiers. 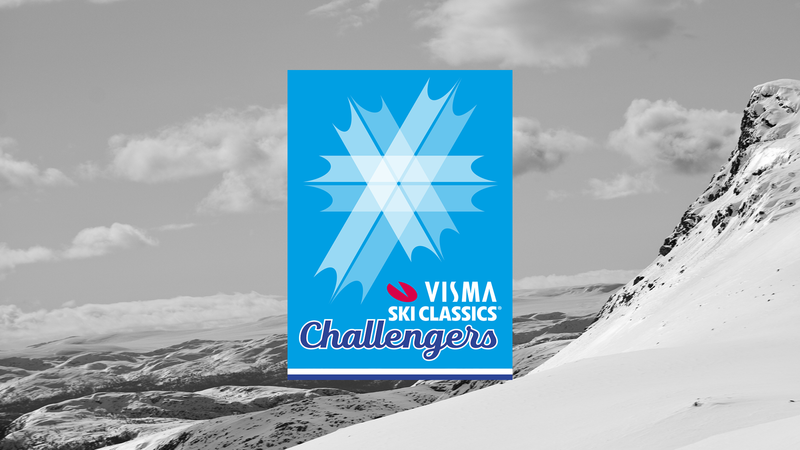 The challenge that Visma Ski Classics described in their Magazine Proskiing was a trigger – it should be possible to traverse the Dolomites on skis, but no one had tried. It was also a fun way to spend a day between our tours. If successful, we wanted to offer it next year to our customers as a possibility to move from one race to the next. 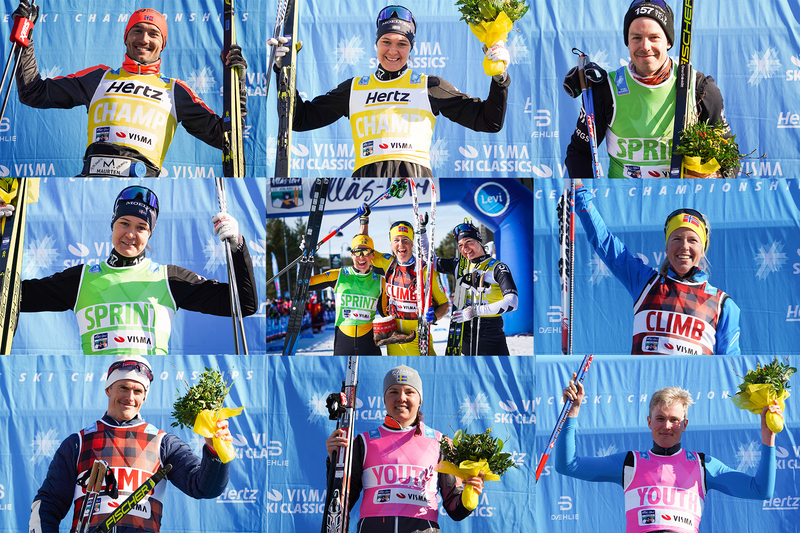 There are several skiers participating in more than one cross country race in Europe this winter. Transport from one Finish to the next Start is usually made by car if the skiers do not fly home and then fly back after a few days for the next race. I took the train from Sweden to La Diagonela and continued by train across Bernina Pass towards Moena and Marcialonga. From Toblach back to Sweden by train it was a smooth pleasure, in comparison to the big problems travellers by car/bus and airplanes had. Going on cross country skis from Cavalese to Canazei is no problem, it is just the opposite direction compared to the Marcialonga race and much more uphill. In the villages, the snow is removed so you have to walk passed each village. In Canazei you can spend the night, or in cheaper accomodations in neighbouring Campitello. Just like when you rent a car, a very kind ski rental offered me to pick up downhill skis, boots, poles and helmet in Canazei and deliver it in Cortina. The shop opened at 8 am and the lifts at 8.30 which was perfect. I wanted to have the full day to get to Cortina before all lifts closed. I had not skied downhill for years, but it was like bicycling, once you know it, it is no problem to pick up the skill after a long break. It was much colder and higher to go downhill skiing compared to cross country skiing. Something to cover your face with like a balaclava is highly recommended for the strong wind. Ski goggles are also essential. A mistake I made was to forget contact lenses. They were in my luggage sent to Toblach… I had to use my normal glasses inside the goggles which was possible, but as soon as I stopped, the world was in a fog. So I did not stop much to have a clear sight. I did not follow the route described in Vismas Magazine, since I had already been to Val Gardena climbing one summer and all suggestions did not work out in reality. I started with two cable lifts to Belvedere at 2377 m, and was stunned! I have had the privilege to visit “The Top of the World” in Bolivia and also at the Tibetan Plateau, but at Belvedere, I felt like I could see all mountains in Europe! The views were totally outstanding. The weather could not have been better with blue skies, sun and no clouds. 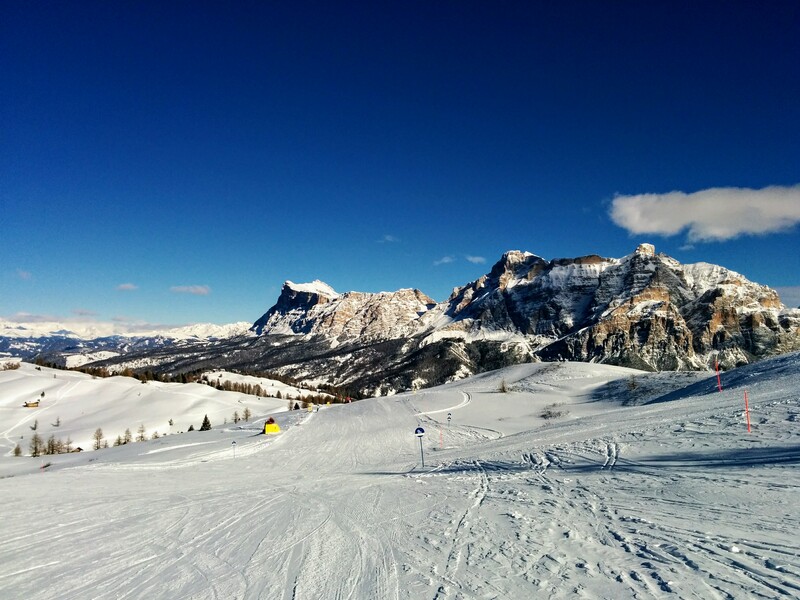 The Sella Ronda, a circular ski route leading round the mighty Sella massif, offers 26 km of downhill trails in a single day. Following the tracks from of Sella Ronda up and down to different alpine villages are a real treat. You don’t have to be an orienteerer to find your way. Just follow the arrows in the direction you want – orange and green. Skip your skimap, it is only confusing, just follow the Sella Ronda signs and be loyal to your decided color, green or orange. The difficulties started when I had to leave Sella Ronda. The maps from Canazei do not cover Cortina, nor the area in between. In Südtirol, Italy’s richest landscape, people speak German, Italian and Ladin. The nearer Cortina I got, less and less people spoke English and there was hardly no information on signposts in English. Leaving Sella Ronda I continued up and down with lifts and on pistes and in the afternoon, the high green church tower in Cortina was visible. Wow, I will soon be there, I thought. This was an illusion. Even if Cortina was in clear sight, I had to continue up and down, up and down with more lifts and down more pistes until I finally reached the bottom of the valley and the center of Cortina. At a part of the Trans Dolomiti Tour, you can do a detour and travel part of the way that is quite flat and a little uphill hitchhiking after horses on skis. This picturesque alternative includes a peak close to 3000 m and an impressive pist of 8.5 km through a wonderful valley with rocky mountain faces and steep ice falls. The route towards Cortina passes the most beautiful part of the Dolomites. Part of the route is inside a UNESCO World Heritage Area. At almost every top of the lifts, you find a restaurant with amazing views, toilets, a wide variety of dishes and drinks and plenty of Apfelstrudle. No one needs to ski hungry. You use all kinds of lifts during the day, from big Cable Cars and egg lifts to open chair lifts and bottom lifts. The trails from Cortina towards Toblach were closed up to Ospitale. I was quite satisfied with skiing and unbelievable views when I reached Cortina. I also had to reach Toblach in order to greet Globalrunners skiers participating in our tour to Toblach-Cortina, arriving in Munich the next day. So I took the bus from Cortina to our hotel in Toblach, a half an hour drive. For those who wish, when the track is open, it is a very nice trail on the old rail road passed lakes, for example Toblacher See with three restaurants in a gorgeous setting with narrow, steep mountains. Next year, Globalrunners will offer everyone interested to join us from Val di Fassa to Cortina/Toblach. We know the way now! Rental of downhill equipment in Canazei with drop-off in Cortina, Ski pass in Dolomiti Superski that covers all lifts during the ’downhill day’ and transport of cross country skis and one bag from Canazei to Cortina will be included. Check www.globalrunners.se for more information about the Expedition that will be published in March.